Collecting large amounts of data to transfer to someone else for analysis can be a real hassle. Hitting the "Forward" button on an important message inserts lawyers and law firms into the communication chain and original metadata makes these messages unsortable in a modern e-discovery database. You could save each message out to a folder and then send those along, but that's horribly tedious if you've got to do more than a few. Luckily if you use Microsoft Outlook on a desktop computer to do email, you can just gather all the messages to one location, then export one single file that is easy to move and is easy for lawyers, law firms, and those that support them to work with. If you know that you need to collect everything in Outloook you can skip this step and just select the root of the mailbox when you are exporting the PST. If you can be more selective, create a subfolder and give it a desctiptive name so you can find it in the future. Then systematically search, sort, and glance through the Inbox, Sent Items, and Deleted Items folders. As you find messages you need to export, you can move them into the folder that you created. If you've got subfolders that you created, you'll want to search those too. After gathering all the email that you would like to export into a single folder, click the “File” Tab in Outlook and choose “Open”, then click on “Import”. A wizard will open up. Select “Export to a file” then click Next. 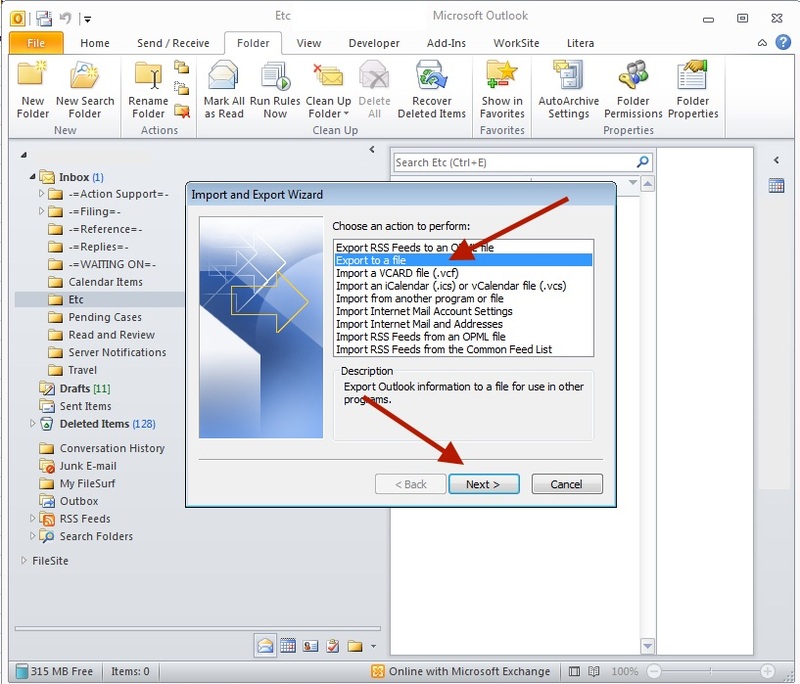 Select “Outlook Data File (.pst) as the file type, then click Next. Choose the folder that has the emails that you want to export, then click Next. Click the Browse button and choose a location to store the PST. The Desktop folder is fine in most circumstances. Give the file a descriptive name, then click Finish. A dialog box will ask you to set an optional password. Generally we do not choose this option. Once the PST has finished exporting, exit Outlook. Your PST has been exported and can be sent for further analysis and review. Next, select "Export to a file" and click Next..